It felt like we had been in the British Isles forever. In fact it was just 10 weeks. The last 6 weeks had been lived a day or two at a time, trying to organize relatively modest boat repairs. But it was holiday season and holidaymaker season, so things took time. We seemed to always be a week from leaving. One item would have a delay of a day or two, then another, then we found something extra that needed to be done, and it all added up. The end result has been worth it. I just wish we’d known in advance it was going to be 6 weeks – we could have spent more time visiting friends in the UK. We’re now on passage from Pwllheli to northern Spain, ideally Vigo. I’m writing this close to Ouessant (France), in very calm seas, motoring with 4kts of wind. We’re having a Biscay crossing that is the polar opposite of the “horror story” reputation Biscay has. Since leaving Pwllheli we’ve had a mix of headwinds, fairwinds and calms going south along the Irish Sea, and anchored at Dale (near Milford Haven) for 36 hours to see out some stronger unfavourable winds. Since then it’s been a straightforward trip around Land’s End and across the channel in fog, and now we’re heading as far east as we can to get the best angle on the ESE winds that are expected to start tomorrow morning and take us to the NW corner of Spain in about 2 days of hopefully lovely sailing. The weather after that is less co-operative, so we still don’t know where we will make landfall. We’ve both easily slotted back into the passage lifestyle – 4 hour watches, dolphins (so many of them on this passage), downloading GRIB files twice a day, lots of reading, cooking, and that indescribable peace, calm and contentment that comes on passage after a few days and once you know that the weather is going to be OK. Cruisers say this happens on different days of the passage – most seem to say day 4, some day 3. For us it seems to be day 3. We’ve got probably another three days to go on this passage now, maybe 4, and I would be happy for it to be longer. And then at the end of the passage there is that beautiful moment of landfall. My friend Bob Crutchfield pointed me towards an interesting cruising blog, and in it the writers commented on how much they enjoyed landfalls after long ocean passages. This is so true for me too. On our 4 day passage across the North Sea in July we didn’t really get that magic of landfall – I think it was that the passage wasn’t long enough. This time I hope it will be. Certainly I can vividly remember past landfalls at St Lucia, Bermuda, Flores and Vigo after long passages as if they were yesterday – moments in time that I’ll never forget. The first few hours ashore when you can still smell the land, so stark and rude after a long sea passage. The first drink (we don’t drink alcohol on passage), usually a bottle of good Cava. Seeing things you have seen before a hundred times and feeling like you are seeing them for the first time. Everything is interesting, fresh, new … rather like a gentle acid trip without the LSD. The night watches are getting warmer as we head south. Sailing in the UK at night it was full foul weather gear, thermal gloves, neck gaiter, several layers of fleece, a warm hat, and sometimes thermal sailing boots. Now in mid Biscay it’s jeans, deck shoes, one fleece, a warm hat, and just the top of the foul weather gear to protect against the wind. The air, although not yet describable as warm at night, is definitely more friendly against my face than it was just a few nights ago. Webb Chiles rather famously said that 60% of the time on a sailboat you are comfortable, 20% uncomfortable and 20% miserable. (He said that in the context of setting out in an 18 ft open boat to cross the Pacific, and considered it equal to his previous voyages in larger boats). This passage has mostly fallen into the comfortable segment, with a little in the uncomfortable, and none at all in the miserable. I sincerely doubt Webb Chiles is casual about his use of miserable (he might put his two weeks adrift on an inflatable dinghy after his 18ft boat almost sank after pitchpoling into the miserable category, for example), so I must conclude that we are doing a rather gentler form of ocean voyaging than him. My estimate is 70%+ comfortable, 25% uncomfortable, and less than 5% miserable. Even compared to those numbers this has been a particularly comfortable passage so far, and looks to continue to be. What a passage this has been. The last two days really have been perfect sailing – a beam reach in bright sunshine with the wind exactly in Otra Vida’s sweet spot of 12-18kts. And it’s warmer. Day watches are now just a t-shirt, and night watches need only a fleece and no outer jacket. We’re in the south again! We’re going to make landfall tomorrow morning, and have decided to head to Carino, just east of La Coruna. The wind for the next week looks to be mostly from the south, and often strong enough to be uncomfortable or worse, so sailing south around Finisterre to Vigo will have to wait. Our plan is to hang out for a time in the Rias Altas, which offer excellent protection from the south winds, and have a reputation for great beauty and great seafood. Sounds like our sort of place. Since we arrived in Inverness on Friday 12th July I’ve been struck by a very special thing going on in these parts: Celtic hospitality. Nothing like the “dour Scots” of legend, rather we found smiley people who seemed genuinely happy to meet us and had time to talk. And this wasn’t just an occasional person – it was the norm in the parts of Scotland we saw, and has continued into Northern Ireland and sometimes into Wales. From lock keepers on the Caledonian canal to people met in the street or sitting at a bar, there was generosity of time and attention, and none of that slightly forced “tolerance of visitors” that one can often sense. The feeling of a warm welcome that comes closest for me has been in Morocco, especially in the Berber villages of the Atlas mountains. The Islamic-based tradition of hospitality is – for at least for this jaded ex-business traveller – almost overwhelming, and raises deeply-ingrained suspicions of where the catch is, where the request for a tip comes, or an overpriced sale of something, or some ‘special’ charge. But there isn’t a catch in Morocco, just as there isn’t in Scotland or Northern Ireland or Wales. It is real hospitality. I believe in it, I try to practice it, but being on the receiving end makes me ever so slightly uncomfortable: how can I repay it? Realistically it is unlikely I will meet most of these lovely people again, and if I did I doubt they would remember the interaction – it was just part of their everyday life. And in a way that is exactly the point. The obvious answer is to pass it on, to perpetuate the virtuous circle of hospitality. The mid July outbreak of Mediterranean weather further coloured our experience of Scotland, with hot sunny days and blue skies adding to the implausibly green landscapes. The hammock came out several times, although the water temperature made swimming a very occasional activity. Water below 18C doesn’t normally meet my criteria for swimability. Loch Ness, where I swam (briefly) on my birthday, was 13C. Northern Ireland and Wales have been more typical in their weather. We spent a week weather-bound in Carlingford Lough, the rather theoretical border between Northern Ireland and Ireland proper. Pounds on one side of the lough, euros on the other, but Guinness, white pudding, Irish accents and friendly people on both. The water was warmer there, 19C when swimming one evening, and the pubs on both sides were great. Wendy joined us for a week in the Scottish islands. We hiked a little, explored the local beers rather more, and talked a whole lot about everything and anything. We went to Dublin to spend a typically riotous weekend with Theresa. My family were vacationing in Abersoch, Wales, so we caught up and spent time together. And Jeff, Klara and Mila visited us in Pwllheli – hiking, cooking, cigars, wonderful conversations, carrot cake, beaches, and Mila learning to climb the stairs on Otra Vida. Lovely memories from all of these summer visits. What we didn’t do much was sail. 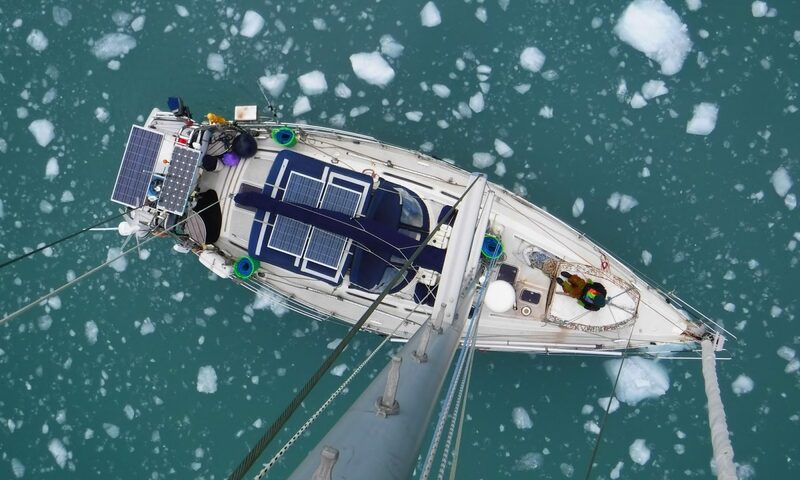 The mainsail cover went on in the Moray Firth, and it came off again for a couple of hours in the approach to Carlingford Lough, and a little on the passage across the Irish Sea. That’s it. The rest of the time we’ve been living on a motorboat with a mast. Reminds me of another aspect of Mediterranean weather – either no wind or too much, and always on the nose. Now we’re in Pwllheli after a minor engine incident six weeks ago that snowballed into needing a new bow roller, anchor chain and anchor. It’s taken a long time … but this is not a bad place at all to be waiting for repairs. Snowdonia has been a revelation – how could I have grown up less than 100km from here and not known how beautiful and interesting the mountains are? Looks like we’ll be on our away again in the next few days, heading south across Biscay. Moules Marinieres. Mussels collected from the beach in Carlingford Lough at low tide by Maret and Annamaria. Cooked with white wine, butter, parsley, shallots and white pepper.